Purple cauliflower is definitely the breakout veggie star of the year and using it as couscous makes this recipe a tasty low-carb option. 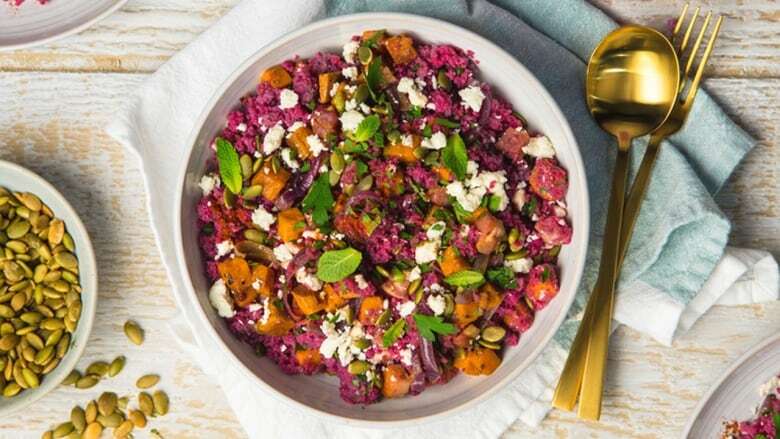 Purple cauliflower is definitely the breakout veggie star of the year and using it as couscous makes this recipe a tasty low-carb option. Opt for keeping the cauliflower raw to make it super fresh and crunchy while maintaining that beautiful purple colour. This is a super satisfying gluten-free dish, and you can even omit the pancetta for a vegetarian option. Perfect for a side — or as a meal all on its own! Add your prepped sweet potatoes, pancetta and red onion to a large baking sheet. Drizzle over 1/4 cup olive oil, season with salt and pepper and bake at 400F for 20-25 minutes or until tender and golden brown. While the veggies are roasting, make your cauliflower couscous. Cut your cauliflower into 4 quadrants and cut off the stems. Break off the florets and transfer to a food processor. If your food processor is small you can do this in batches. Pulse until cauliflower is the size of couscous. Pull out any stems that remain. Transfer to a large serving bowl. Add in roasted veggies and pancetta, chopped herbs, pumpkin seeds, remaining olive oil, lemon juice, spices and salt and pepper. Toss together and taste. Adjust seasoning if needed, top with feta and enjoy!